To begin with, Paul has written a 4-page Prologue that describes 8 different venues for making money with your magic in your hometown...and how to go about getting these jobs. He describes the "pitfalls" and performing advice for these 8 different ways to gain real experience in the magic world. Also included is advice about balloon sculpting! THIS SECTION IS VITAL! The Prologue alone is worth the modest price of this ebook. BUT...the effects included are world-class routines. All of the effects within the grasp of most magicians. Included, is all the patter, photos of sleights and videos for certain sleights. 1) Spectator Deals a Royal Flush - Paul has created an incredibly spectator-involved routine that ends with the spectator dealing herself a Royal Flush. This is a terrific multi-stage routine that the spectators will love. 2) Center Deal the Four Aces - You will almost feel "guilty" about performing this routine. The spectators will give you credit for advanced skills...but this is EASY to do! 3) Out of This World - Most card men are familiar with "the greatest card effect" in the world...but Paul has taken this to new heights. I KID YOU NOT...Paul has created a routine that is absolutely fool-proof. Again - you make the spectator the star! 4) Location, Location, Location - This is an extremely entertaining routine. It is fun for children or adults. The first two transpositions will amaze them...but the final DOUBLE transposition will leave them with their mouths open. AND it's easy to do! 5) 1, #2, 3 Coin Routine - This routine can be performed close-up to cabaret. The kids and the parents will LOVE this 5 minute routine. The children (and parents) laugh so hard that it will be tough to get them to calm down. This is a real winner. 6) Stickman! - This variation a Sander's effect is Paul's favorite routine to perform for children. Wherever Paul goes, the kid's run up to him and scream, "Paul...Do Stickman, do Stickman!" Easy to do and so much fun for everyone. Paul includes the patter for use with children or adults. 7) BONUS EFFECT! - Card Under Glass - Learn Paul's fool-proof method for "getting the card under the glass" multiple times...and NEVER getting caught. This routine is a time-honored effect that is a POWERHOUSE! 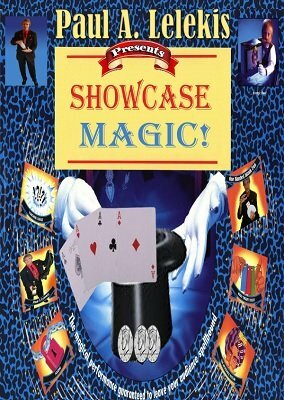 Paul has performed this routine hundreds of times and he even fools "well-schooled" magicians! Paul will teach you methods of misdirection that are incredibly effective! 8) ANOTHER BONUS! Included is a video of Paul's underground sleight, The Broken Packet Bottom Deal (BPBD!) Learn how to expertly deal from the bottom of the deck, rapidly and in succession - from a FULL DECK! This sleight is easy to do and will take very little time to master. EXTRA BONUS! A video of The Lelekis Full Deck False Shuffle. This is the easiest full-deck false shuffle you will ever find and will fool everyone! If you use any kind of set-up (full deck set-up or otherwise), this false shuffle is for you! The Lelekis Full Deck False Shuffle was first explained in the e-book, My Favorites II . You will use this false shuffle over and over. Paul has performed this shuffle for some "world-class" magicians (you know who they are!) and they never even blinked. 1st edition 2013, 32 pages. This is a steal for the money and all you get - it's loaded. True "Worker's" material in the real world of entertaining performance -- stand up, close up, surrounded. Paul has hammered these out for you over hundreds of performances. The introductory advise of how to get gigs and perform at different venues is direct and priceless if you are thinking about taking your magic out to the world. But then you get videos too. My favorites are Stickman!, his handling of Out of this World, and if you have never done Card Under Glass, this is a workers delight.